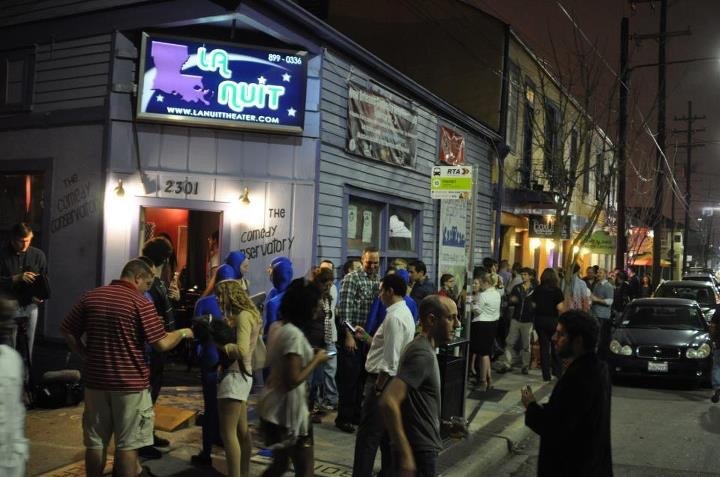 La Nuit Comedy Theater — a pioneering venue for comedy in New Orleans, and one of the last pre-Katrina businesses remaining on Freret Street — closed its doors for the final time last month, its owner said. La Nuit Comedy Theater owner Yvonne Landry first came back to her home in New Orleans 14 years ago, and she quipped she decided to start a comedy theater almost out of “boredom.” Having worked in improvisation since 1992, Landry thought she had trained a lot of people, so she saw opening on Freret as a fun move. During Landry’s stint in Chicago doing live theater work, she had lived near a commercial corridor close to a university area that she always thought would be a good fit for a comedy venue. When she got back to New Orleans, she found the future La Nuit building at 5039 Freret Street — just down the street from both Loyola University New Orleans and Tulane University. Freret Street had very few open businesses at the time and college freshmen were frequently warned not to venture too far down it, but Landry bought the building and started her theater there. In the early days of the theater, Landry would bring in master class teachers once a month because her class was so sheltered, and that proved helpful. Former students Amy Alvarez and Ken Nahan both recently became involved with La Nuit through its all-ages comedy night called ComedySportz. Alvarez, who lives a couple of blocks from the theater, was offered to join the troupe in 2015. She did shows with La Nuit every Saturday for several months at a time and was sad to hear about its closing. “I thought what they were doing there with building this comedy club and this comedy teaching community was really terrific,” Alvarez said. One of Nahan’s favorite memories with La Nuit came from being on stage during the New Orleans Comedy Festival the theater held in 2015, performing sketches that he had learned to write through a La Nuit class. Nahan said he thought the theater could have been advertised and promoted a little better, recalling when sometimes people would forget to place advertisements before a show, but he understood that there was always competition with other events in the city. “There’s certainly a place for comedy,” Nahan said. Landry said she believes La Nuit was “instrumental” in supporting the development along Freret. She saw the street pick up when the cocktail bar Cure arrived on the street in 2008, and then in 2012 to 2013 business for La Nuit grew as well. Landry sold the building in 2012, which she said in hindsight was a bad mistake, since it’s worth more now and her rent increased substantially this summer. While she enjoys being in walking distances of restaurants and shops, Alvarez said she’s aware that these developments have a ripple effect on some long standing businesses. “The gentrification of Freret Street has been very exciting for the neighborhood, but of course gentrification isn’t wonderful for everybody,” Alvarez said. Landry’s fear is that Freret Street is becoming a row of restaurants, but she said the hardest thing to let go of in the loss is the people who the comedy theater was really important for. Next for Landry is moving to Georgia to do film, first guest-staring on a sit-com that got picked by TNT. The La Nuit owner plans to continue teaching, taking all the energy with her which she was using on trying to make a local theater survive. She said she hoped that the Freret comedy theater mattered and that the people she spent time with had a lot of fun in there. “When you’re doing improv and you just hit on something that hits on a big belly laugh with people, it’s a rush, you know,” Nahan said.